Pennington was quite an interesting and flamboyant figure, later a leading member of the Mandelite IMG during the early 1970ies (one of the few authentic working-class people there), he was sidelined in the IMG after being banged up for some time for taking part in a traditional act of dockers' moral economy (which the bourgeois state labelled "embezzlement"): picking up stuff which "fell from a lorry"
If the Cardan pamphlet 'History and revolution' is scanned into the library then it should be accompanied by the Discussion bulletin No 1 mentioned earlier which at least has the merit of pointing out Bob Potter's divergence with Solidarity's and Cardan's one-sided interpretation of Marx (even if it had some merit in relation to traditional marxist ideologies). As usual Brinton got the last say in the matter thus limiting the 'discussion' for the time being but various other dissident members from accross the UK were to take up the same themes later on. I don't have a scanner but have a spare copy of the Discussion bulletin if anyone needs it later. I've got a copy of it - I agree it should accompany the text it's discussing. I'll add it to my pile unless someone else wants to have a go. is already in the library. I'll do the second article and the Solidarity introduction. Going through my boxes I found a copy of a discussion paper titled "Revolutionary Politics and the Present Situation" from 1972 which seems to be by what had been Aberdeen Solidarity either after or as they left. Can anyone confirm if that's right . (And since I've never been entirely clear about their subsequent history can anyone give a brief chronology?). Lurdan, this is great, thanks! CND we just got a copy of so I will do that, but the rest of that stuff would be great! I'm going to update this article above to add in the new stuff, some of which you have put on, probably sometime next week. 34. Socially-Responsible Scientists or Soldier-Technicians ? I've scanned and OCR'd 'The Meaning of Socialism' but I'm still working on it. 'The Squatters' lists no author but I found an advert for it in Solidarity (West London) which attributes it to Andy Anderson. Anyone know if this is correct or not ? Right, scan a bunch more pamphlets and added them all and lurdan's to this index. Lurdan thank you for your sterling work here! For 'The Meaning of Socialism' I've added a number of the different Solidarity introductions and a short introductory note about what Solidarity did to the article. 'Trade Unionism or Socialism' is just the parts not already in the library. As suggested I've left the tagging for someone else so that there is consistency. I haven't put up PDF's for these duplicated pamphlets. '14. Resistance Shall Grow' still has edits awaiting moderation - at the moment the footnotes aren't visible. I should probably have indicated at the time that for '11. Socialism or Barbarism', which I put in the library last week, I added an introductory note about the text and a translation from 'Socialisme ou Barbarie' about the conference it was written for and the attempt at international coordination that came out of it. I'll have a go at the (former) Aberdeen Solidarity text 'Revolutionary Politics and the Present Situation' but It will take a while as the duplication of the original was a little poor causing OCR issues. Until it's clearer what is already being worked on that's my lot. Basically, there isn't anything else being worked on, other than History as creation, which Harrison said he would do at some point. I have one issue of Solidarity for full workers control, by Solidarity South London, then just a load of the journal Solidarity for workers' power. So I'm totally done with the pamphlets that I had. The tags are straightforward: if you just put the word "solidarity" in the authors/groups box that does it. I have also given you permissions to approve your own edits to help save time. If you come to the anarchist bookfair, or our 10th birthday party we'll get you some drinks! 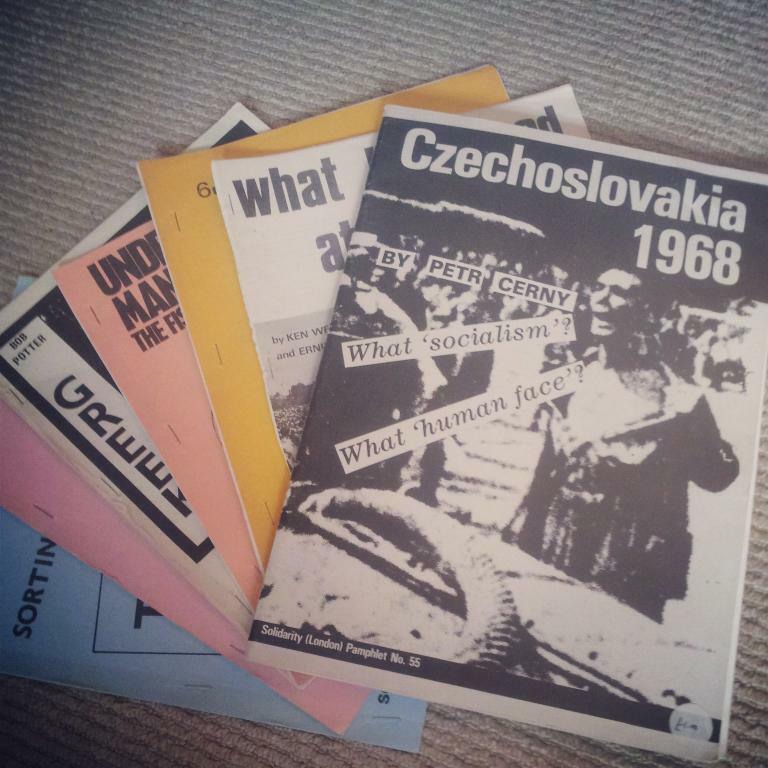 I have various issues of the non-London Solidarity journals. My run of Solidarity for Workers Power itself is very incomplete. but I may have fills. I have the Oxford Solidarity pamphlet, "Urban Devastation" scanned as a PDF file of approx 15 MB. How can I upload this file? Does it have to be converted into another file format. If so, which one, and how? Just click "submit content" then "library", then fill in the relevant boxes (image, title, intro etc) and upload the PDF to the File attachments section. Cheers! Thanks to friend and comrade Phil R. for the scanning. Many thanks to you and Phil, that's really great! Does anyone have these? We would really love to complete this collection. I've scanned 'The New Movement' - should be up later this week.